Renowned stage director Aurélien Bory returns to the Théâtre de la Ville with dance performance ‘Plexus’. ‘Plexus’ plays on perceptions and conventions, toying with our preconceptions of freedom, identity and the restrictions of space. Devoid of language, the performance uses sounds, music and sophisticated lighting techniques to inspire the audience’s imagination. Bory has a habit of putting the dancers that he works with in physically restrictive situations: In his last show ‘Questcequetudeviens?’ he placed flamenco dancer Stéphanie Fuster in a box, creating a powerful image of an expressive body deprived of freedom. Bory has taken this a step further in his new project ‘Plexus’: Japanese dancer Kaori Ito takes up the difficult challenge of dancing amid over 5,000 nylon strings. Dancing in the grip of this spider’s web contradicts the freedom of dance, influencing every one of Ito’s movements by reducing her breadth and threatening to tangle her up with each gesture. 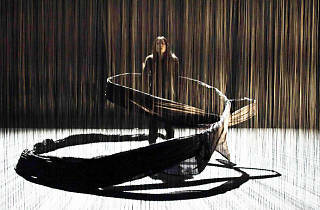 The result is visually powerful: the strings are alive against the black backdrop and blur into a strobe-like effect. 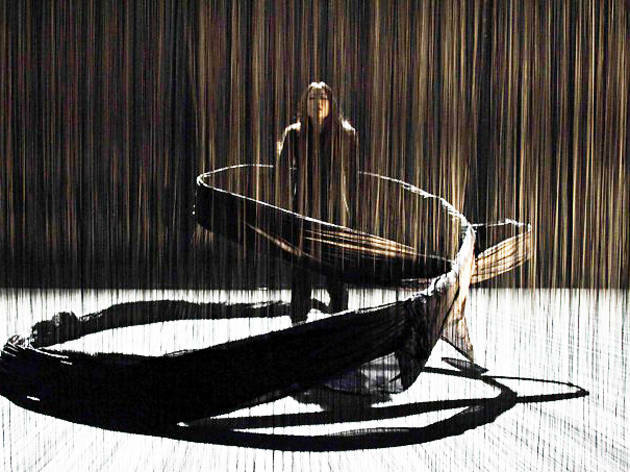 Caught in this curtain of strings, the dancer seems puppet-like and ghostly, fighting to express her primary talent. A flawless performance.